We received a box of mooncakes at work from one of our printers, so I decided to try a bite. Don't know what a mooncake is? Imagine lotus seed paste and salted duck eggs. Sounds delicious right? Well, here's more info for you. Mooncakes are Chinese bakery products traditionally eaten during the Mid-Autumn Festival / Zhongqiu Festival. Typical mooncakes are round or rectangular pastries, measuring about 10 cm in diameter and 4-5 cm thick. A thick filling usually made from lotus seed paste is surrounded by a relatively thin (2-3 mm) crust and may contain yolks from salted duck eggs. Most mooncakes consist of a thin tender skin enveloping a sweet, dense filling. 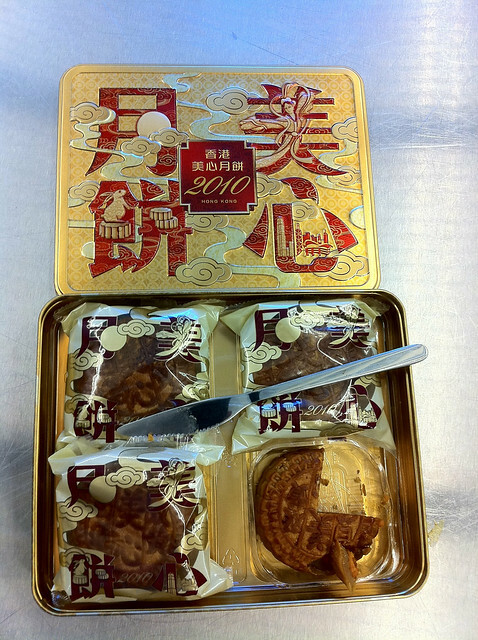 The mooncake may contain one or more whole salted egg yolks in its centre to symbolise the full moon. Very rarely, mooncakes are also served steamed or fried. Traditional mooncakes have an imprint on top consisting of the Chinese characters for "longevity" or "harmony" as well as the name of the bakery and the filling in the moon cake. Imprints of the moon, the Chang'e woman on the moon, flowers, vines, or a rabbit (symbol of the moon) may surround the characters for additional decoration. Mooncakes are considered a delicacy; production is labor-intensive and few people make them at home. Hence, most prefer to buy them from commercial outlets, which may range from smaller individual bakery shops to high-end restaurants. So, I'm expecting to find out either a) I'm allergic to lotus seed paste or b) I've been poisoned with salmonella-infected duck yolk. Wish me luck.